My Latest and Favourite Chicken Chilli Garlic Recipe is in my New Hardbound Cookbook! Garlicky and spicy, chicken chilli garlic has to be one of my all time favourites. I have experimented with this recipe many times and talked my way into a few restaurant kitchens for tips. This is a winner! 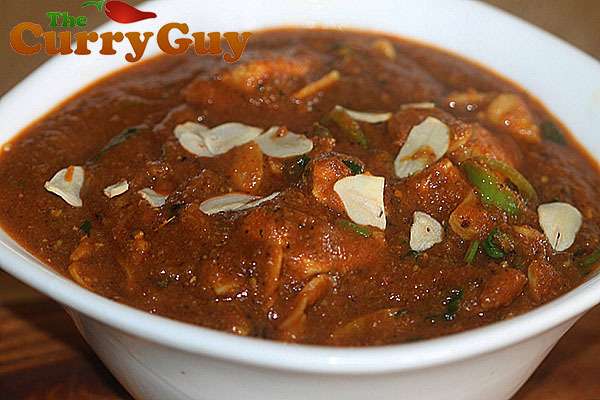 Anyone who loves chicken chilli garlic curry will know it can be quite spicy. This recipe is quite spicy but not numbingly so. You can always add a few more chillies at the end if you want to turn the zing into a zap. 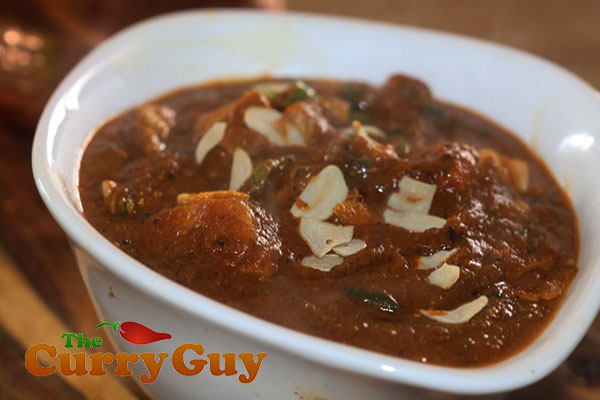 You will notice that I have used a lot of curry powder and tandoori powder in this recipe. Some of you may be scared to do this so start with less if you like. I learned to do this with chicken chilli garlic at my local tandoori. It’s part of what makes the dish what it is. 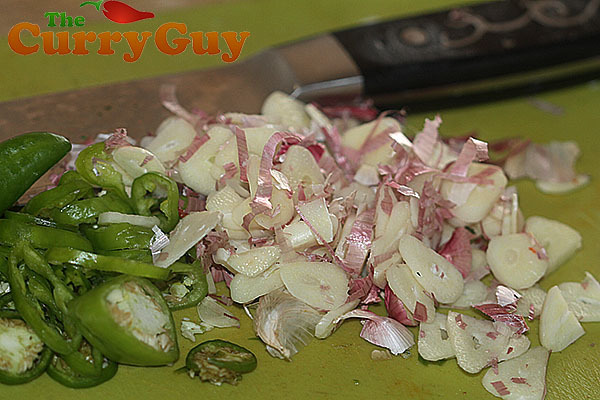 Making chicken chilli garlic couldn’t be easier. 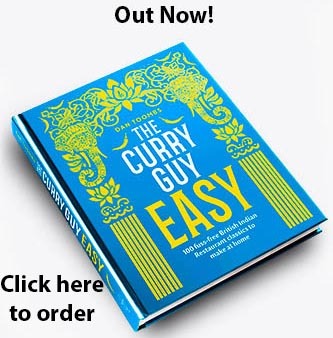 Like all of the curry house favourites posted on my site, you will need to make your curry sauce and preferably pre-cook your chicken but once that’s done you will be able to cook this meal in ten minutes or less. 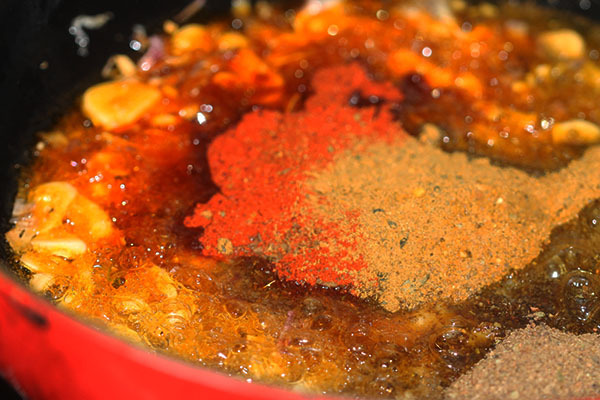 I’ve included links to my own curry powder and tandoori masala recipes. I smoke the spices but this is not necessary to achieve great results! If you are a garlic and spice lover like me, you are going to love this chicken chilli garlic recipe! By the way, if you are eating this for lunch, you probably don’t want to go back to work that day. You won’t be the most popular person. I pre-cook chicken in two ways. Most restaurant use this method to prepare their chicken for this curry. You could also add tandoori style chicken tikka to this recipe if you’d like to create tandoori Chicken Chilli Garlic. Fry the garlic slivers for about a minute or two being careful not to burn them. Add the spices to the garlic and hot oil/ghee. Pour in the heated curry sauce. Add the cooked chicken and some of the cooking juices. Stir in the dried garlic flakes, coriander and tomato paste. Separate your garlic bulb and cut the cloves into fine slivers. I leave the skin on for flavour but you can remove it if you want. 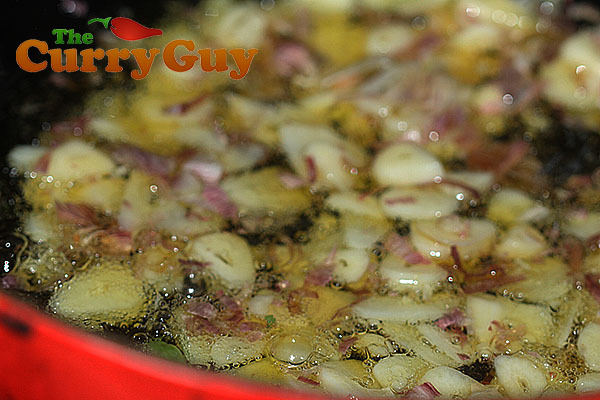 Heat the ghee/oil oil/ghee over a medium heat and add the garlic slivers. It is very important not to burn the garlic. Watch it and move the slivers around in the pan lightly browning them. When lightly browned, add the ginger paste, garlic paste, curry powder, tandoori powder, chilli powder and cumin to the garlic slivers and stir contently for about 30 seconds. 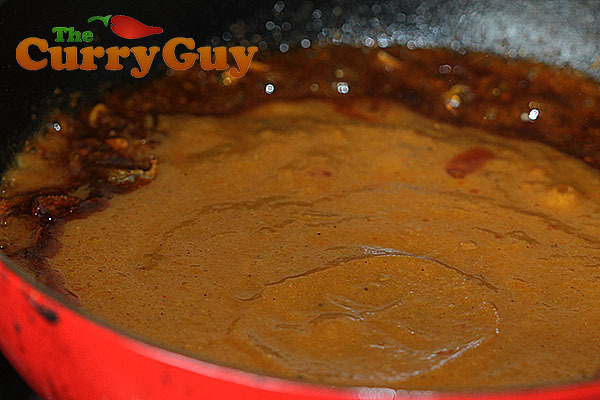 Now add the tomato paste, pre-cooked chicken and the curry sauce to the pan and allow to sizzle for about two minutes. Throw in the raw chillies and stir to combine. Season the curry with salt and pepper to taste and sprinkle with the chopped coriander. Add the crunchy dried garlic flakes. The sauce will literally spit its approval. Awesome! Chicken chilli garlic curry is one of my all time favourites. 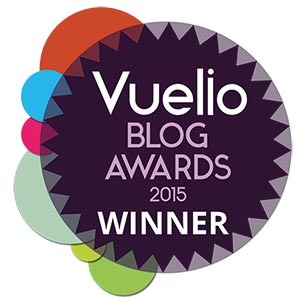 Oooh I do love this blog of yours! 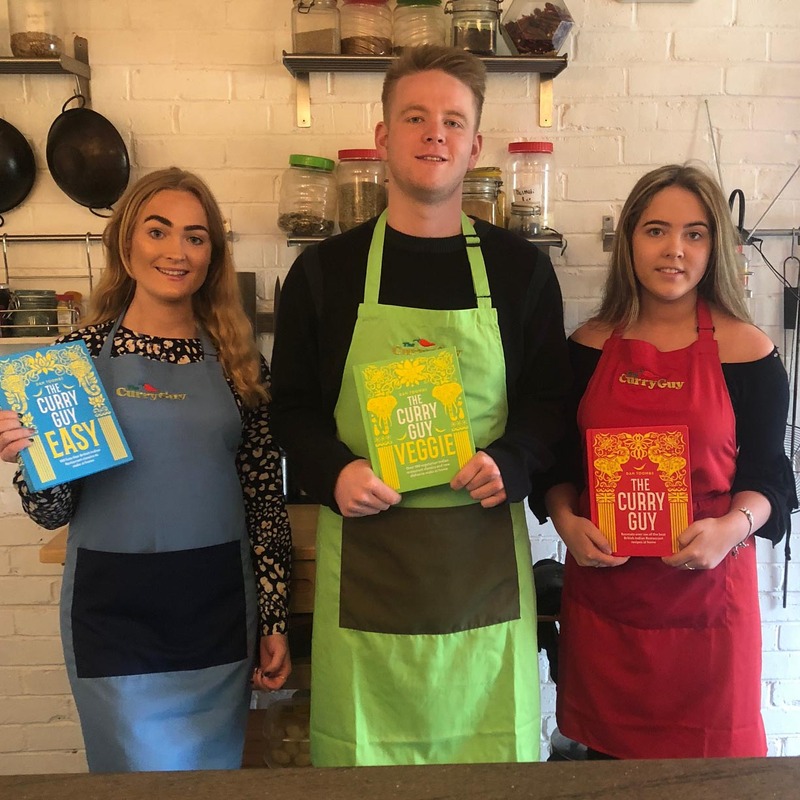 Fantastic recipes. Thank you for noticing. All fixed now. hey dan the man….just made your lovely garlic chilli chicken..and well what can i say….i think it came out even better then my local curry house….am well pleased.. 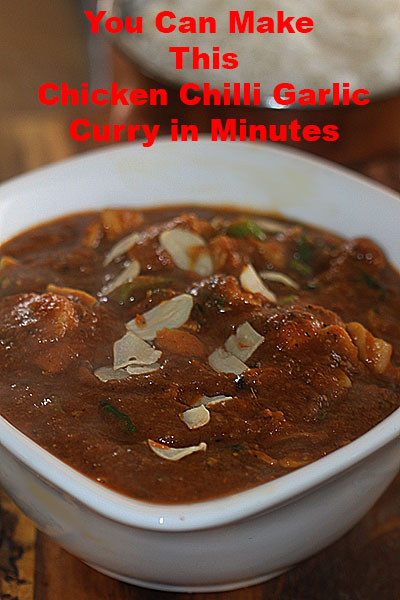 The children and I are cooking your garlic chicken curry recipe as we speak, however, you say you have a homemade curry powder, but there is no link to it. Can I use just normal curry powder? If so mild or hot? Thank you, we’re doing the Chana dhal next! This is the meal I always look for when I go to a curry house, so was looking forward to giving this one a go. I think I need to try this recipe again though, mine just tasted of the curry gravy and I assume that’s not quite right. Thanks Martin for your feedback. I really appreciate it. I’m actually having this tonight. Try adding a bit more of the other ingredients. My suggestions are a guideline but you might like more than I recommend. Please let me know if you have better luck next time. If you do, I would really like to know how you improved it. This is fast becoming our favourite food blog… made this today without any substitutions (almost unheard of for me!!!) and the recipe was easy to follow and turned out amazing. I did half the recipe as there were only two of us… have more left for another day – wish we are both pleased about! 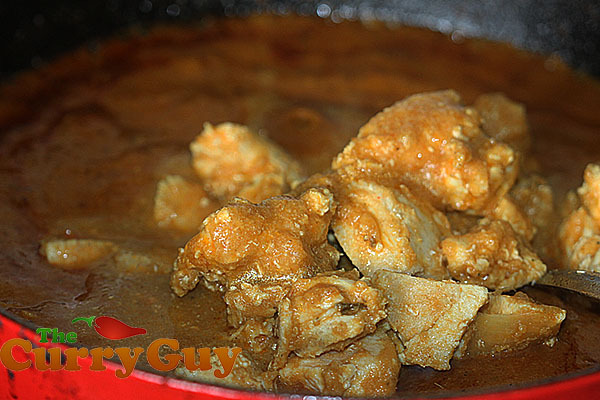 Made the curry powder / gravy and precooked the chicken too – all easy to follow and spot on. Thank you Dan! 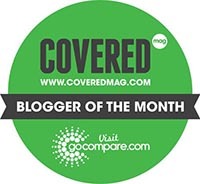 I love you’re blog. I made Garlic and chilli chicken excellent quite hot. I then made onion bhaji and prawn puri the following week brilliant. I have friends coming over for a curry night on Saturday making same again with one other curry not sure what. I love your work. 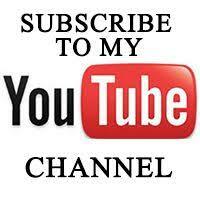 Hi Dan, Love following the blog. I first made the basic curry sauce,then the curry powder, promptly followed by the Garlic Chilli Chicken recipe. I did add 1 pureed fresh tomato with the garlic & ginger puree. I also added half a finely sliced green pepper and a big handful of chopped spinach toward the end because I did’nt have time for side-dishes, but wanted to have veg with it. What can I say my husband was totally ecstatic!!! He’s on a low carb diet so ate it with nuts.. I made enough for 4 but there was none left when he’d finished!! Suffice to say it will have many repeat performances in our house 🙂 Thank you. Followed step-by-step but without fenugreek (unavailble where we live). It was delicious. Thank you very, very much. We did double the amount of green chillies but we prefer extra, extra spicy. Thanks Kristen for trying the recipe. I use a lot more chillies too. Love them. I’m really glad you liked the recipe. Thank you very much for that Hayley. I’m really happy you liked the recipe. I secretly add more chillies from time to time too. LOL. I need to buy your book, but would like it the old fashioned way please with pages LOL, could you tell me where i could get it from, your recipes are ace. Thank you Samantha. I’m working on the printed version. Hopefully very soon. Hi there, This recipe is excellent! I read your reviews and make your BIR curry sauce for the first time and then this Garlic Chilli Chicken – it was delicious. It’s the best recipe I’ve found to make this at home and now I’ve got containers of the sauce in my freezer, I’m going to try more of your recipes. If they’re even half as good as this one, it’ll be great. 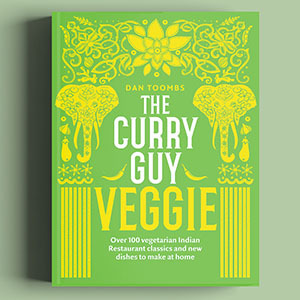 It’s made me rethink my whole approach to making curry! 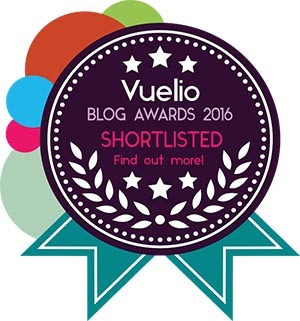 Thanks for all the effort you put into this blog, it’s now firmly on my favourites. Thank you very much Maf! I really appreciate the feedback and I’m happy you like the recipes. I’ve got loads more recipes on the way so please keep in touch. Hi Dan, well I am a Scotsman from Glasgow living in Missouri, and I have been eating curries since I was 15, I am now 63, so you can imagine how many i have eaten, more than once a week,And I have been cooking curries for about thirty or so years, but I could never get a good recipe for Garlic Chili Chicken (my favorite) until I made your one and I know the reason why! lots of garlic a whole bulb!, so I tried your recipe and Wow! Amazing Just like the Restaurant back home,I consider myself a bit of a chef,Indian only mind you, thank you, Oh by the way my wife is a Yorkshire lass,. Thank you very much for the great feedback. I’m really glad you liked the recipe. I’ve been experimenting a lot with that one! I came the other way. Grew up in California. LOL. Please keep in touch. I’ll keep the recipes coming. I would love to go to India someday. For now I just have to settle for cooking the food. I do love it though. Thanks for stopping by and please don’t be a stranger. Hi I’m trying this at the weekend for the first time. When you say 3cups of curry sauce is that with some water?!? And can I add onion? Thanks. Sure. Just make the recipe to your personal preference. Add more curry sauce or even stock. Hope you enjoy. Thank you Will. I do like that one! Thanks for sharing delicious recipe garlic chicken.This is one of the famous Indian non-veg recipe. really it is best combination for Naan, roti, sorghum roti,chapati. even for white rice also. definitely i will try it. I cannot recommend this recipe enough – absolutely amazing!! Had friends for dinner and was informed the food was restaurant standard!! Given the particular friends eat out 3/4 times a week – high praise indeed!! Thank you so much!! Ps. Cooking it again tonight!!! Hi Lindsey. I’m really glad you liked the recipe. I’ll be writing more restaurant style recipes so keep in touch. Just had the garlic, chilli chicken. Thank you very much Mark. Really glad you liked the recipe. This curry sauce!!! I have tryed looking for it in the shops,no luck. Is it here on the site!! So I can make it!! Update – wow, just wow! Hubby and I had this, two children had the Dopiaza, and we froze two portions of each so we get to try the other next time. This was so seriously good that it was hard to believe it had come from my kitchen. Unbelievably tasty. Thank you for trying the recipes. I’m really glad you enjoyed them. That’s what I like to hear. Thanks Michelle. Thank you very much Glen. I’m really glad you like it. Cooked this after perfecting the base sauce, family think I cheated and simply plated up a takeaway lol. Added fresh onions and a green pepper to it, it went down a treat. 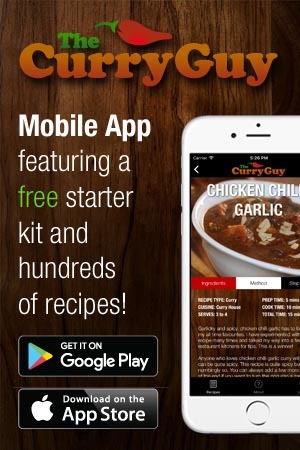 Absolutely glad I googled takeaway curry recipe and stumbled on this site. I have a lot more recipes coming so please keep in touch. I am about to make this for the second time in a month today! I lived in London for three years and struggle to find curries as good as the ones I had there back here in the United States (I live in New Orleans). 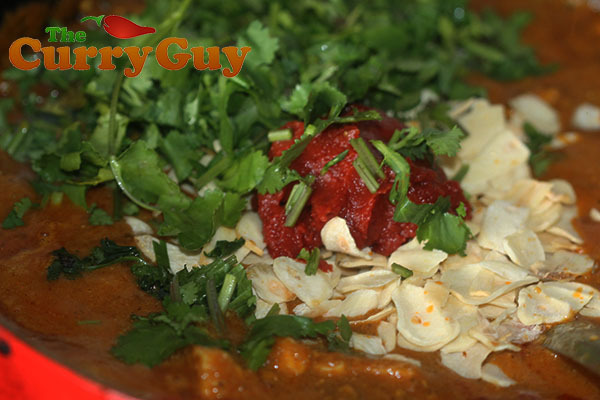 I’ve tinkered with lots of different curry recipes and yours are the best I have found online so far! Never thought I could make such a good curry without coconut milk! Thanks for the recipes! Impressive stuff. Best homemade version of this type of curry I’ve had, and the chicken breast didn’t end up too dry or rubbery, as can happen when using standard non-treated stuff. Look forward to trying some of the other recipes now I’ve got the sauce made up! Really glad you liked the recipe. Thanks for stopping by. Thanks Andrew. Hope you enjoy it. I tried the madras with the small batch sauce which was great, I then made a large batch of the sauce (i got 4 litres!) and made this curry, all I can say is this is another level! I’ve wanted to cook these kinds of curry’s at home for ages and this is by far the best home made curry I’ve ever made! I think I will have to invest in the ebook now, thanks for great recipes, can’t wait to try my next one now. Thank you very much Stuart. Really glad you like the recipe. Looking forward to trying your chicken chili garlic. Why do you use the dried garlic flakes instead of just adding additional fresh garlic? The dried garlic flakes add a completely different flavour. That dish has garlic in three ways. You have the garlic paste, the lightly fried garlic slivers and then the dried. They all work really well together and give the dish more dept. Just to clarify; should step 7 read “Add the dried garlic flakes” (rather than garlic slivers) ? I got confused, as the slivers were used in steps 2/3. That’s right. Thanks for noticing. I have a few amendments to make. No worries. It turned out wonderful anyway, although the house smelled like a curry house for days after lol. I also purchased your eBook on Kindle – does this page predate, or supersede the same dish in there? This was great. I cut down on the heat since my wife don’t like it to spicy. I was still a great taste over all. 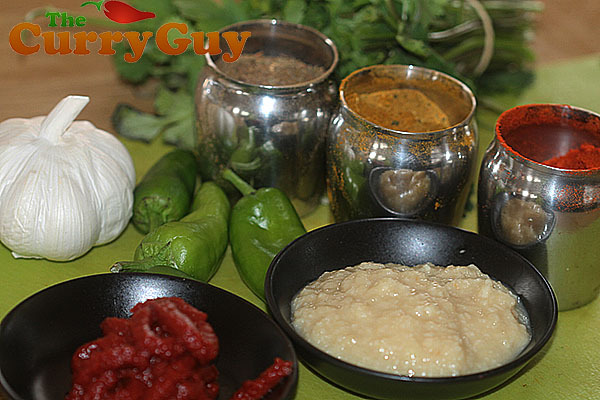 5 stars for a home made curry. Thank you! Thank you Tobias. Really glad you liked the recipe. Just made a large a large batch of curry base sauce, then made this. Oh my, so good!! My belly is full and my mouth is still burny, but all I can think about is what to make next with the rest of the base sauce. Any recommendations? Going to try to make this dish. On the pictures it says “add the dried garlic flakes with the tomato paste and corriader ” but in the instructions it states that the dried garlic flakes are not added until the final step. Please can you confirm when to add the dried garlic flakes? Also on the cooking instructions it states that the dish takes 20 mins to cook but the step by step instructions do not appear to take that long ? Do I need to follow the instruction until all the main ingredients are added and then heat for 10 / 15 minutes? Sorry, that was a typo. You add the dried garlic flakes at the end. They are really just a garnish but they are also good. I make this curry in about ten minutes. If you can finish it quicker than the 20 minutes I mention in the recipe, why not? I was after a garlic sauce similar to one served in a restaurant we used to visit( now closed). Followed the recipe except for only adding half a chilli & warming paneer in the sauce just before serving. ( we’re veggies) I made the curry powder but used shop bought tandoori powder as I’ve loads of it & it was gorgeous!! Served with sag aloo, rice, naan & lager. Stuffed , content & bracing myself for the run I’ll need to burn it off tomorrow. So worth it. Thank you!!! Thank you very much Sue. I’m really happy you liked the recipe. It’s one of my favourites. I am looking forward to trying to make this. I am quite new to cooking so was wondering if you could clear up a couple of queries. In the pictures it says to add the dried garlic flakes with the corrianda and tomato paste but in the instructions is says to add the dried garlic flakes at the very end. Can you please confirm. Also it says that the dish takes 20mins to cook but the instructions seem a lot quicker. Should I follow t.he instructions to get all the ingredients in then heat for 10/15 minutes? Sorry this may sound like a silly question but just want to get it right. Thank you very much. Often at restaurants and takeaways, the chefs use a lot more oil. I use a lot of oil but tend to skim it off the top before serving for health reasons. Hope this helps. Thank you very much for purchasing my book. I’m glad you are enjoying the recipes. A friend of mine introduced me to your cooking and it’s brilliant! I’ve got your book and am enjoying working through it. For this recipe can i just exactly double anything to make a larger portion or is there anything that would need reducing or increasing? Thank you very much for purchasing my cookbook. I hope you enjoy the book and recipes. You can certainly double the recipe. I do this all the time. I’ve made the same curry for 30 people. Good luck with it. Can I use tomato purée rather than paste?? Ive been cooking your amazing curries for over 2 years now for our touring bands and my family. 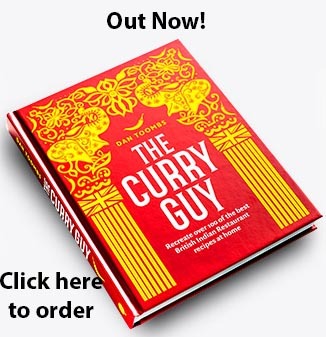 I have always been looking for the ultimate curry recipes which I found with you. Thank you for sharing the secrets that had eluded me for years. Great to hear Guy. Thank you. I bought your book and have had quiet a lot of success however I failed on this one. The curry ended up with a terrible bitter after taste. I was very careful not to burn the garlic so not sure what happened. Thanks for getting in touch. Without see the ingredients you used, it’s hard to say. That said, many people find certain spicy terribly bitter. The common problem spices are turmeric, fenugreek and cumin. I’m not sure if you made my homemade curry powder and tandoori powder but both of these recipes call for those spices. Shop bought spice powders also often include them. I recommend trying each of the above spice to see if any of them gives you that bitter flavour you don’t like. Great to hear Dave! Thank you. Hi. The links to your curry power are not working. I’ve made your madras powder before. Is it this one? Also have lots of curry sauce and tandoori powder! I make a lot of your curries and they’re amazing! Thanks. I’ve got that already so will try this dish tonight!